This boot carrier is made of heavy duty cordura with stainless steel Dee rings. This is very durable and well made. 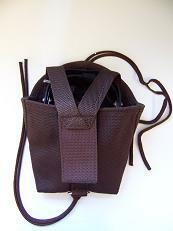 It easily ties onto any area of your saddle to carry your spare horse boots without the annoying bouncing. Made with generous proportions to allow for even the largest easyboot styles. Also available in a larger version to allow for Boa Boots or Old Mac Boots. Easy boot version available in Brown for $24. Boa Boot version available in Black for $28.